Could UFOs be a load of rubbish? COULD the mysterious orange UFOs spotted above the Fraser Coast be just a couple of old garbage bags? 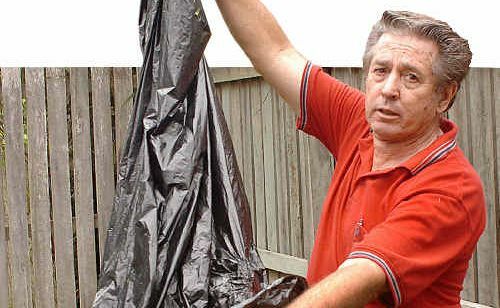 That's what Maryborough man Geoff Williams wants to know after finding a large plastic bag with wire framing in his backyard. Mr Williams was among hundreds of residents left scratching their heads this week as report after report of strange orange globes slowly moving across the night sky surfaced. But when he found the bag behind his garden shed yesterday he was reminded of an experience many years ago. “One of my apprentices made a rubbish bag lantern. You get a small bag and attach a fire source such as a tea light (candle). “The heat fills up the bag and makes it float. The Chronicle continued to be inundated with phone calls and emails yesterday from residents who saw the orange lights in the night sky over the past week and a half. Believers and sceptics also voiced their opinion online, including “Praetorian” of Hervey Bay: “My theory is that these are more FCRC great ideas. They seem quite bright at first (at least to FCRC) but then they disappear and no one has a record of them”. “Jerabek” of Tiaro had a more serious opinion and directed readers to thousands of previously classified files with details of UFO sightings and an alien abduction, which was released yesterday by the UK Ministry of Defence. And the mystery of residents being unable to capture the UFOs on their cameras also appeared to be solved yesterday, with three residents phoning in and claiming they had managed to capture the orange lights. Hot air and rubbish or alien UFO? This poll ended on 04 June 2011.